He kept his secret more than 30 years. As secrets go, what Fort Worth businessman Earnest O. (Soapy) Gillam held under his hat all those years was not that dark. But when he did what he did, it could have cost him his life. Despite Prohibition, most of the decade of the 1920s deserved its Roaring ‘20s label. Bootlegging flourished and crime spiked sharply in the aftermath of World War I. The Dow Jones average rose, as did women’s hemlines. The high crime rate and other social issues led to the rejuvenation of an old organization called the Ku Klux Klan. It may have been a secret society, but the KKK quickly achieved mainstream status in Texas. Many judges, sheriffs and police chiefs who wore black robes or badges by day donned white robes and hoods at night. 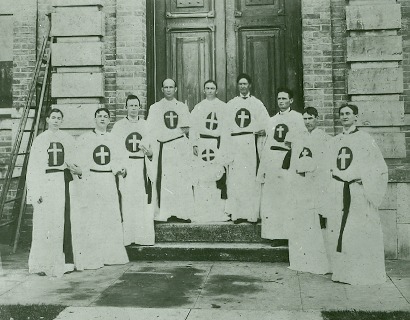 Ku Klux Klan shown standing to the Wharton Courthouse steps. Soon, government officials in Texas needed Klan backing if they wanted to get re-elected. And first-time candidates sought the KKK’s endorsement if they were not already members. The Klan grew so large in Dallas County, no building in the city could accommodate their meetings. Though later claiming he did so with reluctance, Gillam joined the hooded order. C.A. Sellers, who wrote Gillam’s privately published biography, does not give the date, but sometime in the early ‘20s, the Klan staged a large conclave near Austin. Gillam attended, standing with scores of others around a burning cross as the white-robed men argued over who to endorse for this race or that. Still, his critical remarks sent the crowd into a frenzy that degenerated into the next closest thing to a riot. When someone pulled the cross down, Gillam found his way back to his car in the dark and drove to his hotel in Austin. Ensconced in his room, he telephoned the Austin Statesman and leaked all the details of the Klan meeting to the newspaper. After taking a lot of calls from men who agreed with what he had done at the Klan gathering, he told the hotel operator not to put through any more calls and went to bed. About 2:30 a.m., someone knocked loudly on his door. Pistol in hand, Gillam moved to the door in the dark, cracking it just enough to see some men he quickly realized had not come to his hotel room in the middle of the night to praise his anti-Klan stand. “The first one of you who tries to force his way in here will be filled with lead,” Gillam’s biographer reconstructed what he said. The men did not try to get into the room, but they desperately urged him not to reveal to the press what had transpired at the KKK meeting earlier that evening. Then they left. But the book revealing the story did not come out until 1958, long after the Klan was anything but an ugly memory in Texas. Texas Masons also helped in ridding the state of the Klan. When a Klan organizer requested an audience with the Texas Grand Master, Andrew L. Randell listened to his pitch. After hearing the Klan’s case, Randell refused to join or give the hooded order an endorsement. Another unsung hero in the Klan’s defeat was A.R. Stout, a young attorney elected to the Legislature from Waxahachie in 1924.